Spock, Kirk, McCoy...man, do I love this show! The recent passing of Leonard Nimoy was not entirely unexpected given that he was in his 80s and had been suffering from health issues the past year, but it was nonetheless sad. The outpouring of tributes from his friends, family, colleagues, and fans was nice to see and showed just how much of an impact his work as an actor, director, voice artist/narrator, and photographer had made over his long career. Of course, to almost everyone he is and forever will be linked with the character he played that defined his life as an actor: Spock. Certainly this is how I knew Nimoy best as an actor and director, and his passing made me step back for a moment and really reflect on why I'm such a huge Star Trek fan. I'm a science fiction fan and enjoy many series and franchises, from Star Wars (the movies) to Dune (the books) and more, but my absolute favorite has and always will be Star Trek. And while I'm a fan of all of the TV series and movies they've made, the first one I ever became hooked on was the original series and it is still my favorite to this day. Star Trek was created by Gene Roddenberry, who envisioned a serious show taking place in the future where different species of aliens and humans would live in relative harmony and band together to protect and explore every corner of the universe. To this end, the original crew of the USS Enterprise was made up of human men and women of different races (white, black, Japanese, Russian, etc) and a Vulcan named Spock, portrayed by Leonard Nimoy. Rounding out the main characters were Captain Kirk (played by William Shatner), Dr. Leonard "Bones" McCoy (DeForrest Kelly), Engineer Montgomery Scott (James Doohan), Mr. Sulu (George Takei), Communications Officer Uhura (Nichelle Nichols), and Ensign Chekov (Walter Koenig). The series focused on the deep personal bonds and friendship between Kirk, McCoy, and Spock; of particular interest was the struggle of the half-human, half-Vulcan Spock trying to balance the logic of his Vulcan side with the emotion of his human side. This internal struggle and Spock's (through the excellent acting of Nimoy) journey through life trying to reconcile the two made him the most popular character of the entire franchise, as well as one of the most iconic and popular characters in television history. The original run for the first Star Trek series was from 1966 to 1969. In that time, it ran for three seasons (79 episodes) and did poorly in the ratings, yet it had a rabid and dedicated fanbase made up almost exclusively (at the time) of teenage boys. 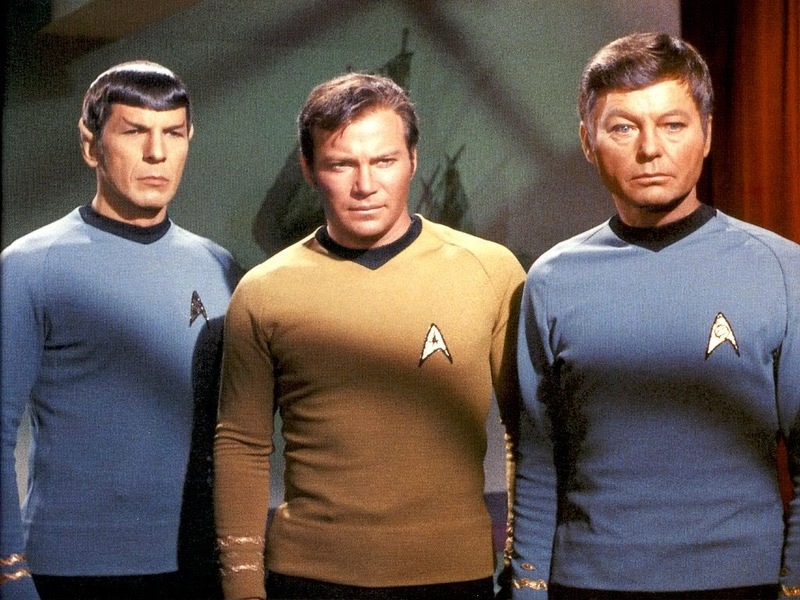 My dad and two uncles, who are big Trek fans, grew up during this time period and watched it during its original run; they were hooked on it then and are still fans to this day. The series was initially cancelled after the second season but was renewed for a third season after a huge letter writing campaign from fans swayed NBC to bring it back. However, it wasn't until the series was cancelled for good in 1969 and it went into syndication that the fanbase exploded and the Trekkie phenomenon was born. The demand for more Trek was so great by the end of the 1970s that creator Gene Roddenberry had planned a new TV series called Star Trek: Phase II, which would continue the adventures of the original crew. However, the series was scrapped and eventually turned into the first Star Trek film, which was released in 1979 and kicked off the second wave of Trek mania that has endured to this day. There were a total of six movies made featuring the crew from the original TV series, as well as four more TV series starting in the late 1980s (The Next Generation, Deep Space Nine, Voyager, and Enterprise) and multiple movies featuring the Next Generation crew. All of the series and movies were tied together, taking place in the same universe across hundreds of years and featuring a lot of continuity between characters, planets, storylines, and so on. More recently, JJ Abrams has relaunched the franchise with two excellent new movies in the 2010s that take place with a new cast, detailing the adventures of the original USS Enterprise crew but in an alternate universe. As a nice touch, a part was written for Nimoy to reprise Spock, stranded in the alternate universe that the new films inhabit. While I am a fan of all of the Star Trek series and films, my favorite has and always will be the original series and the first six films featuring the same characters. Part of this is due to the fact that it was the series I grew up watching as a kid and thus is the one I know best. But the main reason that it's my favorite is because in my opinion it has the best characters, the best writing/acting, and the best stories of all of the series. Yes, the special effects were primitive, even for their time (the show is legendary for the shoestring budget they were given to work with by NBC and how fast they had to film each episode), but beyond possessing a late 1960s charm, the effects are really not that bad. Furthermore, the success of the show and the fact that the storylines (well, most of them) were and remain so captivating and interesting shows that it was a series driven not by impressive visual effects, but by characters and stories that drew in and captivated scores of fans. Star Trek was blessed with some great writers during its initial run, writers who were able to weave gripping and interesting stories that took turns featuring each of the main characters, investing time and energy in presenting fleshed out lives and backstories for all of them. Whether a particular episode was humorous, depressing, philosophical, political, exciting, or a combination thereof, there was usually something interesting going on. Some of the best known episodes, which are also among my favorites, are "Amok Time," "The City on the Edge of Forever," "Balance of Terror," "The Doomsday Machine," "Space Seed," "Mirror, Mirror," "The Trouble With Tribbles," and "The Tholian Web," to name some but not all. Take, for example, "The City on the Edge of Forever," which was written by the great science fiction writer Harlan Ellison and is routinely sited as the greatest Trek episode of all time. It deals with issues including time travel, love, and making difficult choices that may be right but aren't easy (I don't want to give anything away if you haven't seen it). The emotional ending was and still is something not seen on most network television shows, especially in the 1960s. That is perhaps the way in which Star Trek was most ahead of its time and the aspect of the show for which Roddenberry and his writers deserve the most credit: their bold and visionary presentation of societal and technological matters through the medium of a dramatic television series. Their vision of a somewhat Utopian future where citizens from different nationalities and alien races would come together in peace to work toward a better future was, for a time, realized in our lifetimes (although this has sadly been undone over the past decade-plus). The presentation of women and minorities in positions of authority and importance in Starfleet, which is basically the outer space version of the Navy, was groundbreaking and something we take for granted now in both real life and in entertainment. Furthermore, where Star Trek was really eerie in terms of its prescience was in its depiction and prediction of future technology. From the belt-clip communicators (cell phones), phasers (tasers...as long as they're set on "stun"), and tricorders (iPads) to all of the various non-invasive medical advances they portrayed on the show (many of which are very real in 2015), Star Trek showed what was possible with imagination and vision, while the real world turned those fictions and fantasies into very real and beneficial reality. Of course, we haven't solved the problem of space travel and human space exploration beyond going to the moon (yet), but I certainly hope that when we do, the future will look more like what is depicted in the Star Trek universe than the alternative. As to why I have loved this show and all of its spin-offs so much, it really comes down to the fact that it has fired my imagination with so many interesting ideas and philosophies that have always kept me thinking long after I've finished watching. The interesting characters, ships, alien races, gadgets, battles, and storylines are all great, of course, but what has kept me and countless others captivated for so many years are the ideas the show presents; much of this is because of how much closer our world has come to resemble the world of Trek, at least in terms of technology, communications, and the subsequent shrinking of the world these have engendered. Perhaps the bigger picture is that it forces us to think and to ask questions of ourselves: how would we react if our future were like that of Star Trek? When presented with similar situations and choices to make, would we choose the pragmatic path? The peaceful route? Would we resort to force only as a last resort? Would we set out to conquer and colonize the universe as we have done for millennia here on Earth, or would our missions be more similar to the ancient explorers who simply wanted to chart the world and make contact with new societies and civilizations for peaceful purposes? Obviously none of us have concrete answers to any of these questions since we are not at the point of needing to answer any of them in 2015. It does, however, make you step back, pause, and think a bit and for me at least that is the coolest thing Star Trek has to offer. In a way, I've always thought it was the most realistic and grown-up science fiction on film. While I've always been a huge fan of its closest rival Star Wars, the way I've always looked it is that Star Wars is children's entertainment that can be enjoyed by adults, but Star Trek is grown-up sci-fi that kids can also enjoy. My understanding of Star Wars and the concepts behind it haven't changed too much from when I was 10 to now, but the absolute inverse is true when it comes to Star Trek; I understand it a whole lot more now at 35 than I did at 10. Maybe it sounds silly to be discussing a television and movie franchise in this way, but then again Star Trek has always been more than that and it will continue to be long into the future. A great post I was watching a few old episodes lately and they are very much in that old vein of thoughtful Sci-Fi. You can understand why it has such a cult following. Definitely! I think the late 1960s look and feel of it (at least the original series) adds to it, in a good way of course. I've always thought it's the perfect blend of action and story...cerebral but with enough action and suspense to make it fun. I have been a fan for many years. However, my favorite series was next generation. To me it was more realistic. Of course, I love them all including the original series and Spock was my favorite of all the characters in all seasons. I was saddened to hear about Leonard Nimoy's death but he leaves a great legacy. Next Generation is great! That's my second favorite series...purely as a series, it's probably better than the Original Series, although there is something about the first series that I just can't describe that makes it my favorite. The only knock about Next Generation is that half of the films they made were great and half were fairly weak (but still enjoyable). There really isn't anything Trek-related that I don't enjoy to some extent, though. Regarding Nimoy, you're absolutely right and even though he was Spock, I hope he is remembered in the future for having done many more things in his long career than Spock, but he'll forever be identified with the half-human/half-Vulcan and that's a legacy anyone would be proud of.